Mark Twain said, “I never let my schooling get in the way of my education,” but I’m afraid we have. “You don’t understand. There are days I seriously think I’m going to lose my mind. I can’t stand being there.” This student was being perceived as a bucket that had to be filled by the wisdom of the teacher pacing in front of the classroom, and as a result, he had all but checked out, even considering dropping out of school. In the past decade, how many students have sat in schools feeling this way? As I talked with an out of state friend several summers ago, we compared education in both of our states. 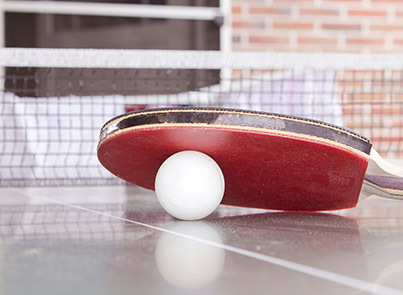 She described it as a game of ping pong -- teacher serves assignment to a student who quickly interacts with it and returns it, just waiting for the number of points and the next serve. Win or lose, play continues until the end of the year with everyone required to play the same game by the same rules with the same equipment. Classrooms I sat in as a child were exactly this way, just like the ones my grandparents, parents, and unfortunately, even my own children have experienced. Assignments are handed out, completed and returned only to begin a new serve. As a child, I was forced to conform to a left brain education, tormented and uneasy even approaching the school building. Learning was about compliance, achievement and ranking. The expectation was that I would sit there, take everything in and repeat it back. The students with the best grades were the best students. Sadly, this methodology continues to be widespread. In my career, I was determined to change that for the students who crossed the threshold into our learning space. Each day I committed myself to laying a foundation of inquiry and possibility, where learning was exciting and conformity only existed in the minds of others. I never entered my classroom thinking that there were boundaries that would define student learning; possibility was always my mantra. It wasn't easy. I was criticized and even reported for changing the rules. It was difficult, but I was lucky for many of my years “behind the door” to have supportive building leaders. Since I have always tended to be the “odd man out” in my thinking, I spent a great deal of time reading and researching so I would be prepared to defend the changes for my students. After I was told by a peer that my room was a circus, I reflected and realized that her assumptions were easily made from the outside since she never stepped into our learning space. Our space was one of safety where students could take risks, ask questions, develop opinions, share ideas and not only fail without judgment, but use that failure as a catalyst for learning going forward. Not long ago, my son angrily said, “You people think I’m a failure because I didn’t follow your rules or get the grades you wanted.” There is no bigger slap in the face. Guilty by association, I was grouped into “you people” who, by our actions, our teaching methods, and our silent judgments allow students to make generalizations about themselves. My son was desperate to learn differently, elevate his learning, share his knowledge, and engage with information rather than simply regurgitating facts, but he had no choice and no voice. He desperately wanted to do work that was thought-provoking rather than rote, but there is no room for different in ping pong. My son, who resorted to disengagement and apathy, not completing work and never cracking a book, was in that situation because he had no other way. It was his only voice in a world of conformity. The world has changed, but education has not. Yes, we have more “things” in our buildings, but the way we teach has changed little in our hundred year old industrialized education. Students need teachers to facilitate deeper understanding, elevate learning, foster thinking, and encourage questioning. After leaving us, students will be challenged to solve problems and develop new ideas, not regurgitate facts. It is past time to redesign learning and engage students in thinking. Dr. Yong Zhao, a Foundation Distinguished Professor in the School of Education at the University of Kansas, says, “Everyone is different, but in education, we look at your shiny nose as a problem, not a strength. "* We expect all students to not only learn the same thing at the same time, but we also don’t want anyone to step out of line or expect to be able to learn or demonstrate understanding in a different way. We must look at every student with potential, not as outliers who need to be fixed. They each have unique strengths. I was that “shiny nose” student, and as a teacher, I refused to allow my students to be viewed as outliers in our learning space. My own child’s opposition to being standard -- desperately needing a different learning experience, but having to play the “school game” -- galvanized me to a place where I knew I could never be part of the traditional “sit and get” at the expense of students. I always remember that I serve students, not a ping pong ball. When we begin to shift our perspective, taking a critical look at learning from a student's perspective, our mindset may begin to shift. If we reflect on our classrooms and ask ourselves how different they really are from the classrooms we sat in, we might be surprised. Would you ask everyone in the world to drive the same vehicle? Eat the same meal? Wear the same clothing? In education, that is exactly what we have done for years. We’ve asked students to learn in the same compliant way and produce the same information. Although we may teach the same curricular area or grade for an entire career, our students get only one opportunity. It’s a moment that could impact their entire future. They don’t have time to wait for us to consider a shift in our thinking or have discussions and meetings and think tanks to decide if we should begin to consider change. It is time now; match point. *Dr. Yong Zhao, "How Do We Enhance Our Education?" Melissa Weatherwax is an educator with nearly twenty-five years experience working with students. Currently, she serves K-12 students and colleagues with instructional technology; co-teaching, collaborating, and providing professional development with education technology and transforming learning. Spending most of her career as a lead learner in an elementary classroom, Melissa worked collaboratively with teammates and building leaders, was known to push the boundaries of traditional education, and worked to create a unique, supportive learning environment to benefit all students. Our students get only one opportunity. They don’t have time to wait for us to consider a shift in our thinking or have discussions and meetings and think tanks to decide if we should begin to consider change.